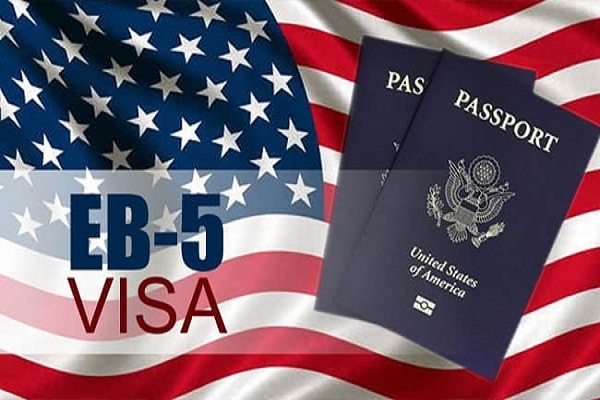 If you’ve been following the news, you know that change is in the works for current immigration laws and nobody knows what will happen with the EB-5 Visa program. Investors are rushing to complete their EB-5 visa petitions with a $500,000 investment as the current deadline looms, but may be extended when the president and Congress agree to fund the federal government, again temporarily. There is great expectation that Congress will move forward and make changes to the green card process and the EB-5 program by implementing more substantial investment requirements in excess of $1,000,000. Legislatively, the president and Congress have tried to agree for a long time on changes to the EB-5 law, reaching no solution, so they merely “kicked the can” down the road, deciding to extend the program with no changes temporarily. Administratively, the agency, U.S. Citizenship, and Immigration Services (USCIS) has proposed changes that will be implemented sooner or later, but no one knows when. All proposed changes, whether legislatively or administratively, include raising the minimum investment amount to well over $1 million making it much more difficult for foreign investors to apply for EB-5 visas. 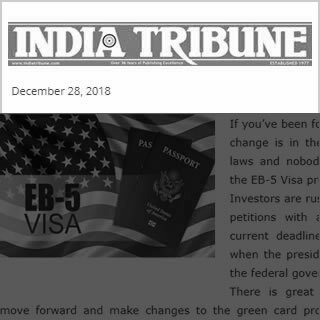 Nobody knows when these changes will take effect which is why investors are scrambling to file their EB-5 petitions ahead of changes. 1. What is the track record of the project sponsors and EB-5 Regional Center? 2. What are the other funding sources of the project and are they committed yet? EB-5 capital should not be deployed until the project has secured 100% funding. 3. Is the project already under construction? (Investors should be leery of a project not already under construction since there is a chance that not all of the funding will come through.) If yes, what assurances are there that construction will be completed? Is there insurance in place to cover this unlikely possibility? 4. What is the product type of the project? Most EB-5 projects are real estate developments. Hotels and offices are more susceptible to the fluctuations of an economic downturn whereas housing, specifically affordable and workforce housing, is more stable. Does the investor want to invest in office space that may take a year to lease up or an apartment complex that will fill quickly? 5. How much is the Subscription / Administration Fee? Typically, administrative fees can add $50,000 on top of the initial $500,000 EB-5 investment. 6. Does the project have exemplar approval from USCIS? Meaning, USCIS has already approved the project and its offering documents to include; the Private Placement Memorandum (PPM), Limited Partnership Agreement, Subscription Agreement, Business Plan, and Economic Analysis Report (which estimates the number of EB5-qualified jobs). 7. How many jobs does this project create for each investor? The minimum is ten but, more is better. 8. Is an I-526 insurance policy offered which will refund the full amount of the $500,000 investment in the unlikely event that USCIS does not approve the I-526 petition? Smith is keenly aware of the challenges immigrants face. His own mother immigrated from Taiwan decades ago, and he knows firsthand the impact immigrants can make in their adopted country. “Immigrants are great achievers and that’s why I’m doing my best to offer these investment opportunities for foreign investors,” said Smith. EB5 Coast To Coast’s mission is to help investors achieve their investment and immigration goals as smoothly and efficiently as possible. 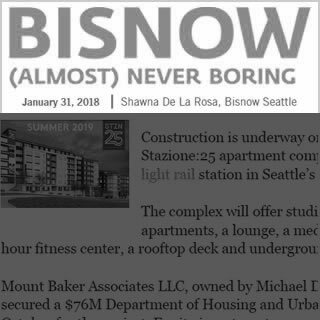 Construction is underway on the two-building, 301-unit Stazione:25 apartment complex near the Mount Baker light rail station in Seattle’s Rainier Valley. The complex will offer studio and one- and two-bedroom apartments, a lounge, a media and gaming room, a 24-hour fitness center, a rooftop deck and underground parking. 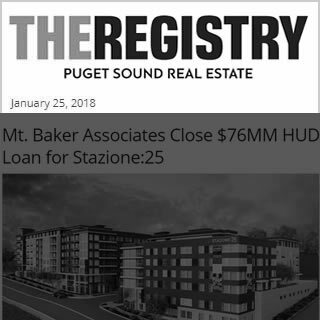 Mount Baker Associates LLC, owned by Michael D. Ross and Robert Spitzer, secured a $76M Department of Housing and Urban Development loan in October for the project. Equity investment was provided by both local investors and EB-5 funds from foreign investors procured through Reve Development partner Christopher Chen. The location has historically served as a landing pad for immigrants, Ross said. “For us, continuing the cycle by having a project that fosters immigration and enhances this vibrant part of town, that sustains diversity and provides economic growth is a wonderful opportunity,” he said. The project is slated to open in summer 2019. Friday morning three well-dressed men stood in the rain and decided who would wear one of the two hardhats they had. Around them, local television crews readied their equipment. 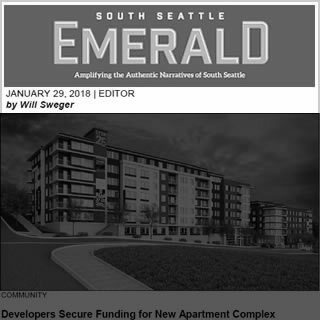 The three are part of the investment group around Stazione: 25, a new 301-unit apartment complex which will sit perched on the slope of Beacon Hill overlooking Rainier Valley. In front of the rolling cameras, several amused construction workers, and an RV parked on a dead end street on the hill above the clearing, they proudly announced their team had completed financing the project with the approval of a $76 million 221(d)(4) loan from the Department of Housing and Urban Development. The owners explained the Italian “Stazione” refers to the area’s diversity in hosting a community of Italian immigrants. 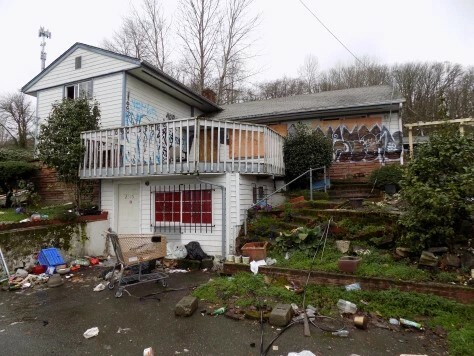 Behind them, overgrown, rain-soaked lot sported a slatted chain link fence filled with graffiti and several piles of garbage. Of the four homes that used to exist on the spot, only one still stands with its windows covered in boards. Trails elsewhere on the property lead between thorn bushes to former encampments of people living in a forested clearing. 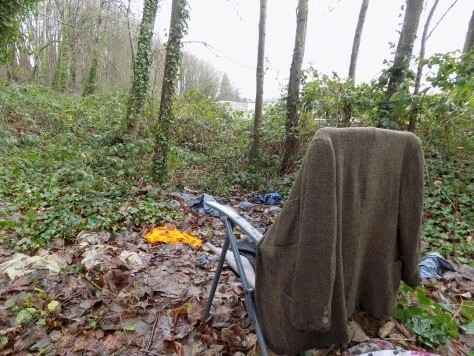 Tarps tied to trees, abandoned clothing, and an overturned kiddie pool mark their passing. The pattern here mirrors that taking place elsewhere in the city—investment firms purchase land, then it sits vacant for months or years while they await funding and approval from the city to begin constructing new housing. In the interim, squatters make use of the properties as a place to stay. 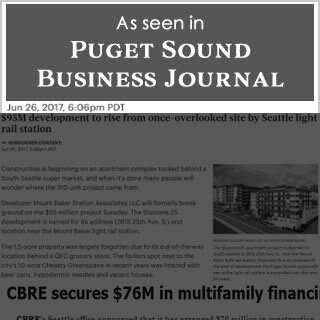 Mount Baker Associates LLC started buying land on the acre and a half site in 2008, paying millions for property a short distance from the Mt. Baker light rail station. A contract rezone dispensed by the city allowed the two new buildings to stand seven and eight stories tall. “The City of Seattle has been really supportive of our project, a little slow in the permitting process. They’re a little behind the eight- ball now, but in terms of their support for our project we were very pleased,” said Michael Ross, the Principle of Reve Development and joint owner of the site. The new complex will use the city’s Multifamily Tax Exemption Program, giving the owners a tax discount if they guarantee 20 per- cent of the new units will be deemed “affordable” by attaching their rental price to percentages of the area median income. The building will offer studio, one and two bedroom units with prices starting at $1,450 a month for studios. The 20 percent units will be- gin renting at $1,028 for studios, $1,344 for one bedroom units and $1,836 for apartments with two bedrooms—prices still out of reach for many residents in the community. The project will also take advantage of the government’s EB-5 Immigrant Investor Program which grants foreign investors lawful permanent residence visas for investing in businesses projected to create employment in rural areas or places with high unemployment. President Donald Trump renewed the almost three decade old EB-5 program as one of his first acts in office, and according (https://fas.org/sgp/crs/homesec/R44475.pdf) to the Congressional Research Service, 84 percent of visas the program granted went to Chinese investors in 2015. Christopher Chen procured $500,000 mostly from Chinese investors for the new development. As his family looked on, he took turns with co-owners Ross and Spitzer piloting a small excavator to tear down the dilapidated fence on the property. Amenities in the plans right now call for a small theater, a fitness center, garden areas, rooftop decks, and a bocce ball court. The building will also feature 221 parking spaces in an underground garage. Osborne Construction Co. plans to complete the site in the summer of 2019, with the Indigo Management Company lined up to provide building administration. SEATTLE – January 24, 2018 – Mount Baker Associates LLC invites you to the first day of activities and site tour. Join owners, Michael D. Ross and Robert Spitzer, as they begin operations and lead a site tour for their overseas investors. 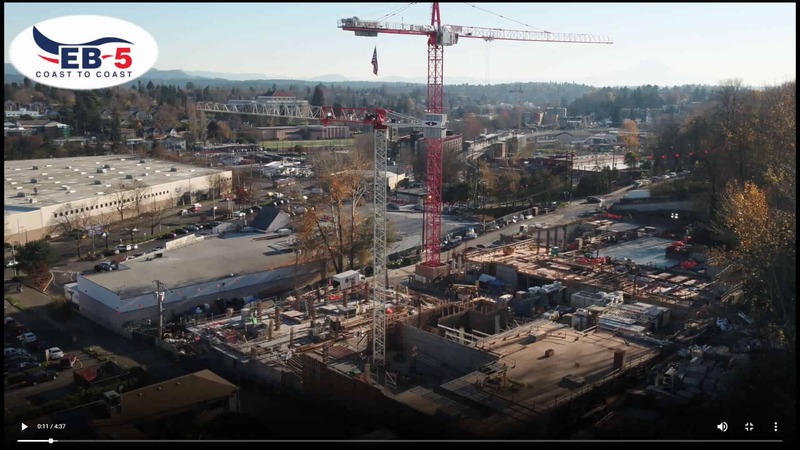 Site activities begin Friday at 10:00 a.m., hard hat tour starts at 10:30 a.m. Stazione:25 is located at 2615 25th Ave. S., Seattle, WA 98144. Stazione:25 is a two-building, 301-unit development adjacent to the Mount Baker light rail station in Seattle’s Rainier Valley. 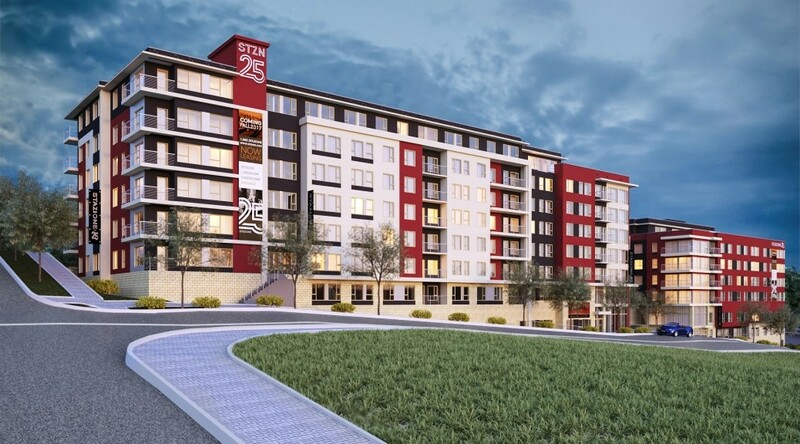 Project developers, Ross and Spitzer recently closed a $76M HUD 221(d)(4) loan for construction and permanent financing of Stazione:25 funded through the US Department of	Housing and Urban Development arranged by CBRE’s John Taylor and James Bach. 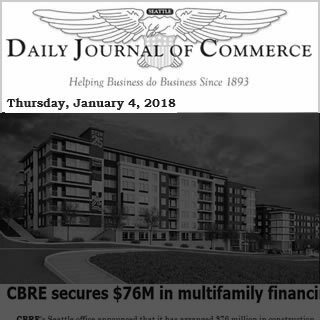 Equity investment was provided by local investors paired with EB-5 investment from foreign investors committing at least $500,000 in job-creating accredited developments procured by Christopher Chen. The developers are encouraging investment from overseas to ount Baker, which has traditionally been a diverse and welcoming neighborhood. 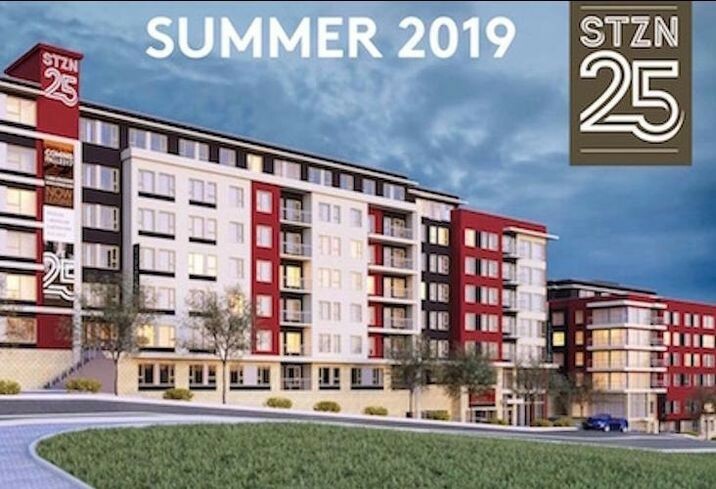 Slated to open in the summer of 2019, the Stazione:25 property is nestled within a well established neighborhood with a grocery anchored shopping center and the 43-acre forested Cheasty Greenspace park land next door. Residents will enjoy the walkable neighborhood with light rail at their doorstep to take them to favorite destinations; Safeco Field and CenturyLink Field, downtown Seattle, SeaTac Airport, Capitol Hill and the University of Washington. Riders can reach downtown Seattle in 12 minutes or the airport in about 30 minutes. 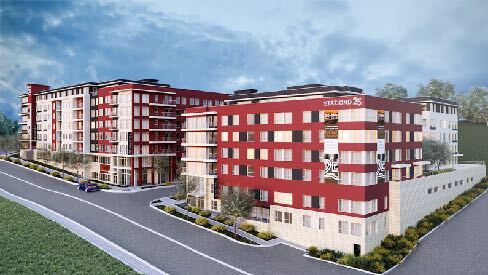 The two buildings will feature three floor plans; studios and one or two-bedroom apartments with energy saving features to reduce environmental impact and high efficiency HVAC systems, elevators and low-flow water plumbing fixtures to improve indoor environmental quality. On-site community amenities include; a tenant lounge, media and gaming room, 24-hour fitness center, pea patch planters, a rooftop deck and 221 below grade parking spaces. EB-5 investment inquiries: contact Steve Smith at www.stevesmithdev.com or www.EB5CoasttoCoast.com. CBRE’s Seattle office announced that it has arranged $76 million in construction financing for the two-building, 301-unit Stazione: 25, which broke ground last summer near Mount Baker Station. CBRE’s John Taylor and James Bach arranged the HUD loan for the ownership group, which is led by Michael Ross and Rob Spitzer. 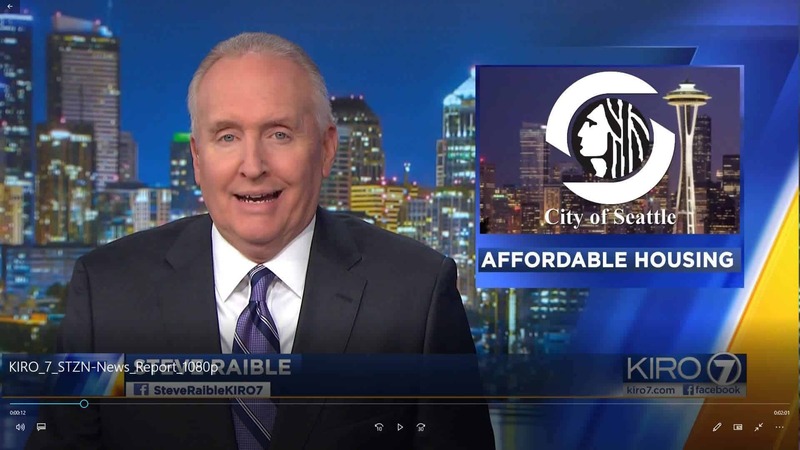 Ross said in a statement, “Seattle needs quality and affordable housing, especially close to downtown and along the light rail line, and we are glad to join the growing and diverse Mount Baker neighborhood. We appreciate the support of CBRE and HUD.” Scheduled to open in 2019, Stazione: 25 is being built by Osborne Construction Co., and was designed by Morgan Design Group. Mt. 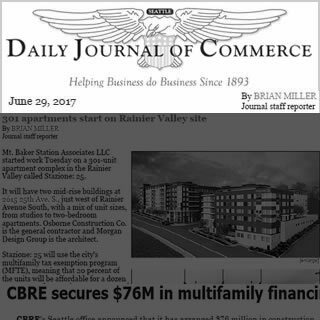 Baker Station Associates LLC started work Tuesday on a 301-unit apartment complex in the Rainier Valley called Stazione: 25. It will have two mid-rise buildings at 2615 25th Ave. S., just west of Rainier Avenue South, with a mix of unit sizes, from studios to two-bedroom apartments. Osborne Construction Co. is the general contractor and Morgan Design Group is the architect. Stazione: 25 will use the city’s multifamily tax exemption program (MFTE), meaning that 20 percent of the units will be affordable for a dozen years, pegged to varying percentages of area median income. Rents for market-rate units will start at $1,450 per month, and rents for affordable units will start at $1,028. The project ownership group is led by investors Michael Ross and Robert Spitzer. The owners also announced a $77 million HUD loan to help finance the project, along with EB-5 investors. 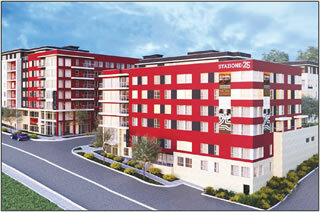 Ross and Spitzer are working with developer Steve Smith on Stazione: 25. They acquired the 1.5-acre site for a reported $4.6 million. A subsequent contract rezone allowed the two buildings to be seven and eight stories tall. Stazione: 25 will be a five-minute walk north of the Mount Baker light rail station, and have 221 parking spaces below grade. Amenities will include a roof deck, community rooms, garden space and a fitness center. No retail or commercial space is included. The developers said the LEED gold apartments will have solar panels, high-efficiency elevators, low-flow plumbing fixtures, a high-efficiency HVAC system and other energy conservation measures. The project is scheduled for completion in the summer of 2019.